Showqueen Productions presents FAT SWAN - An Adults Only Christmas Panto at the Reginald Theatre, Seymour Centre. "Showqueen", "Fat Swan", "Adults Only Christmas Panto" are all clues and concepts to the boisterous, ridiculous, rough and ready, vulgarity that one can catch at the Seymour Centre in FAT SWAN. Trevor Ashley and Phil Scott found inspiration from the psychological thriller film event of this/last year, BLACK SWAN, by Darren Aronofsky, starring Natalie Portman, and have gleefully, but, for my expectation and money, too superficially, parodied and crammed into the form of the classic Christmas Panto format a show called FAT SWAN. Mr Ashley as Natalie Portly a ballerina, doubling in the trad panto widow function, leads his cast of brave and intrepid actors: Tara Morice, Lisa Adam and Reality TV Showhunk, Brendan Moar through the trials and tribulations of most of the high moments of the film in the high style of travesty. (Some of us might call the style just "over-the-top-campery"). For added to that scenario are famous show tunes, that some of us know, with new lyrics (Musical Director, Daniel Edmonds), dance numbers (Choreography, Cameron Mitchell) and panto interactions with the audience,(be prepared if you are seated around the the cabaret-style tables), including showers of lollies, and a plethora of entertainment industry in-jokes, that some may need a glossary to get. And do take good heed of the warning that "FAT SWAN contains strong language and adult themes." You might need to consider, who you take to this show, for not a lot of the humour is P.C. (but then, you wouldn't be going if you expected something else, like good taste, would you?). The audience, the fans, generally, had a raucously good time. The closer you sit, probably the better. It is a steeply raked auditorium and one could feel, as we did, even in Row G, just slightly out of the realm of infectious surrender to the vibe.If you indulge in the diplomacy of bibulation before and during (and after) it might also aid your enjoyment. FAT SWAN is Mr Ashley and C.o under the direction of Garry Scale, kicking up thir heels or on their toes for this end of year "concert". It certainly still needs work, tinkering with, but even in its present knock-about-state is capable of keeping you amused. Two years ago, prior to Mr Ashley's performance tour in HAIRSPRAY, I fell under the admiring spell of his talent when I saw him in I'M EVERY WOMAN at the Sydney Opera House. 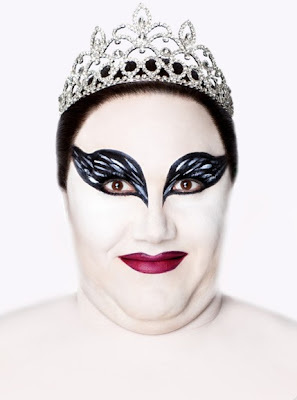 FAT SWAN does not give an inkling of his real gifts and talent (His voice slightly 'ragged' on Saturday night) and I look forward to his return in Cabaret format next year - he plugs that promised offering shamelessly, all through the night. Book for that. Paul Capsis and iota were present on the night I went to see the show. If you add Eddie Perfect, Miaow Miaow and the up and coming Sheridan Harbridge (See blog, SLOWBOAT TO CHINAMANS) there is a staggering wealth of talent available to scintillate and confront around on our cabaret circuit.